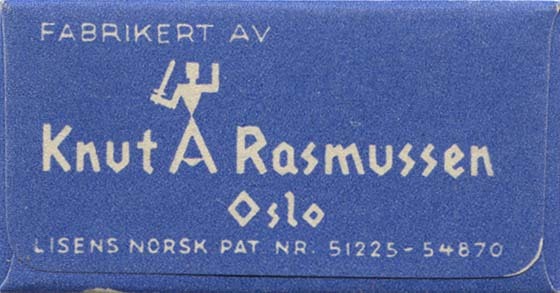 There was more razor blade manufacturers than I ever suspected in Norway back in the day - "Knut A Rasmussen" from 1928 was one of the larger ones, able to make 6 million blades a year in 1938, which was not bad in a country that had about 2.8 million inhabitants at the time. 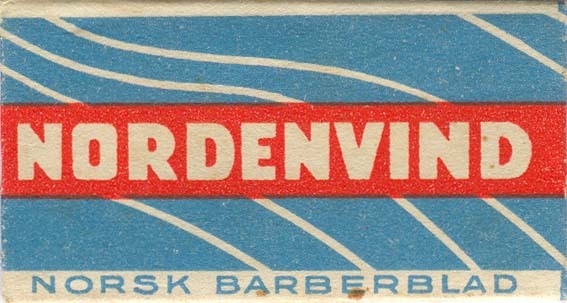 Like most other Norwegian razor blade manufacturers they was gone by 1956, killed off by cheaper imported blades. 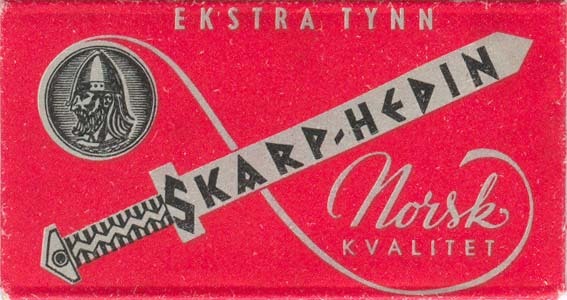 Manufactured blades under three different brands; Lyn (lightning), Nordenvind (Northern Wind) and Skarphedin (Son of Njål, from the old norse Njål's Saga). 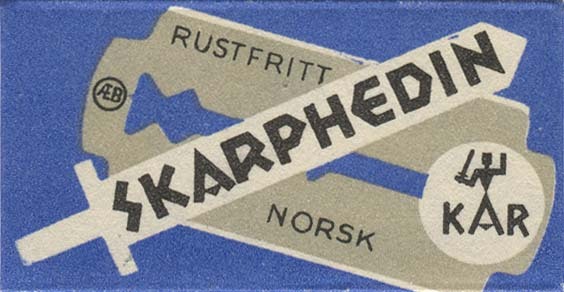 Like the Nordkapp I mentioned last week, the labelling on the various blades speak volumes of the political and military situation at the time; i.e. : Norway was occupied by Nazi Germany, and a puppet regime was at least trying to pass themselves of as having the trappings of power. 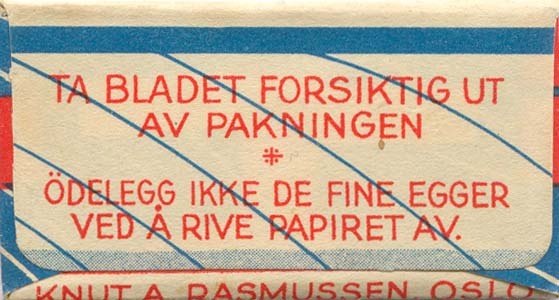 A simple, no nonsense early wrapper. I like how the N is a lightning bolt, a visual reference to the name of the blade. 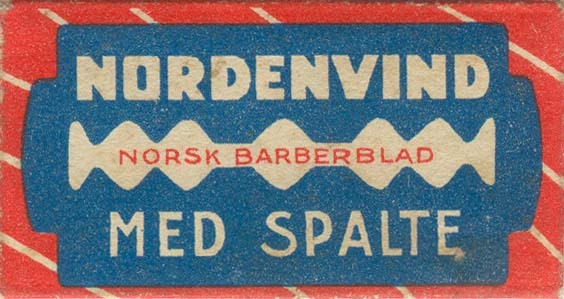 "The Northern Wind" factory employs only Norwegian workers, and is the only factory in Norway which uses the old - but for razor blades new - grinding method "obliquely on the edge". For raw materials is used the best quality special-steel, 15% thinner than normal. 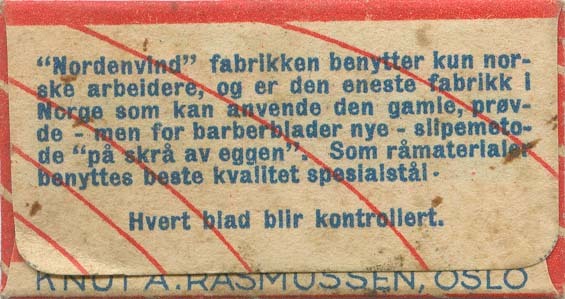 Each blade controlled"
The reference to using only Norwegians cuts both ways, interestingly enough. 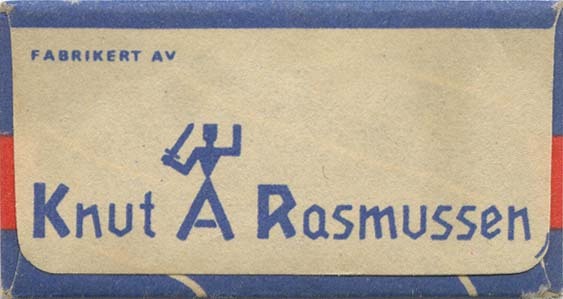 The German occupiers and the Quisling collaborators tended to come down heavily on anything that hinted at the western allies, while the public tended to boycott any industry that had overt connections to Germany. 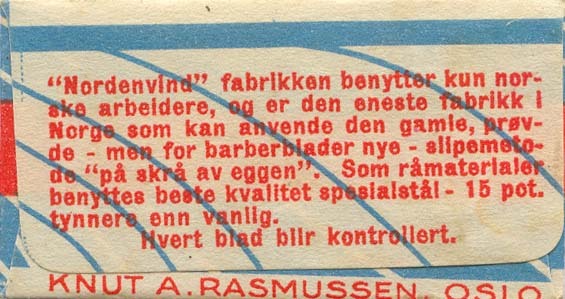 Same text as above on the back, except not mentioning the thinner blade. 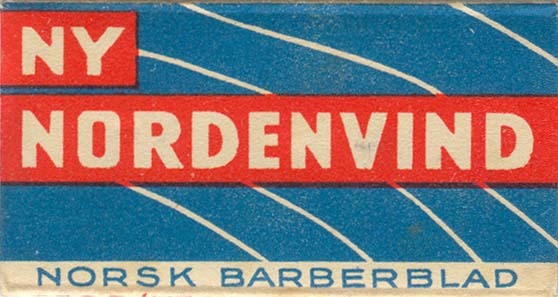 I assume that means this wrapper hid one of the old style thicker blades. 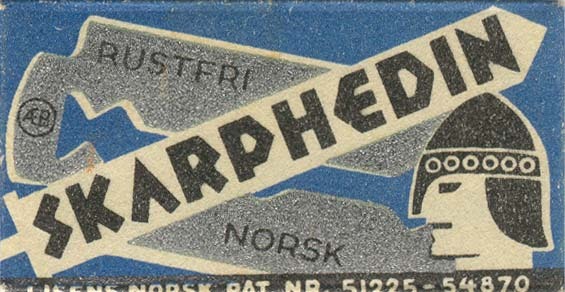 "The Northern Wind" razor blade is manufactured by Norwegian workers in accordance with a particular technique that is the result of long experience and thorough experimentation. 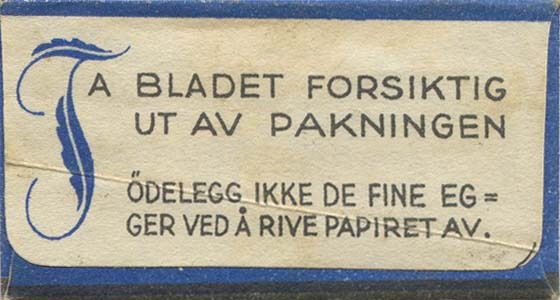 Only the highest quality Swedish special-steel - 15% thinner than normal blades - is used as raw material, and the manufacture is carried out as precision work. Each blade is controlled. 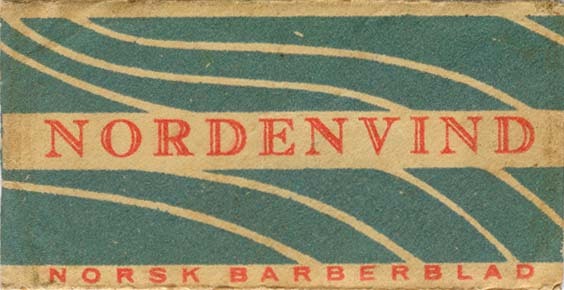 It has an edge that lasts longer, and that will give a better and more comfortable shave. 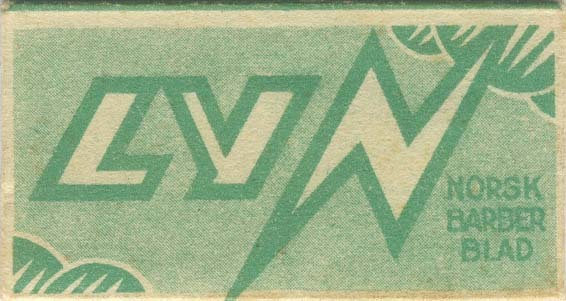 Not much to say, apart from enjoying the logo and how it's used on both sides of the wrapper. Remove the blade carefully from the wrapper. 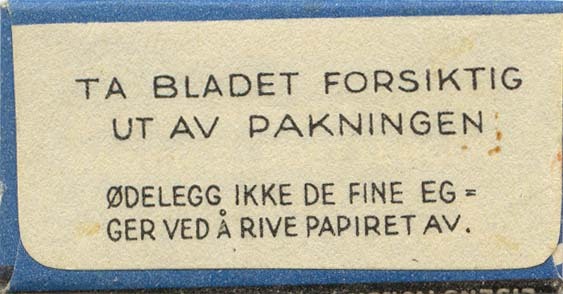 Don't destroy the fine edges by tearing of the paper. Good advise today as well... Have to wonder what made this blade "New" though... other than the wrapper. 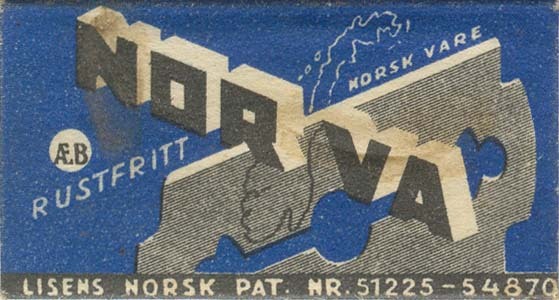 NOR VA is not a new brand, but a "no brand" - it is short for Norsk Vare (Norwegian Goods). 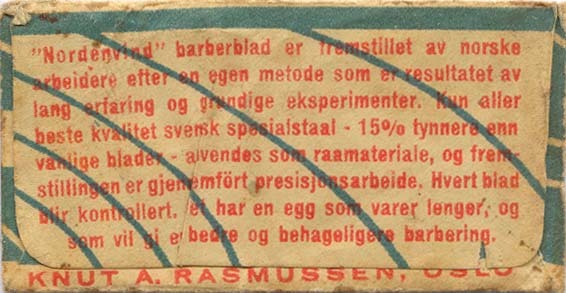 During the War (aka WW2), there was a move to remove the brand name on certain items - soap was the most well known - in order to aid rationing and prevent black marked trading of more popular brands. I suspect this is caused by some of the same logic, but since the back of the wrapper is unchanged, it's still easy to identify the blade. Rustfritt means stainless by the way - a direct translation would be "free from rust". 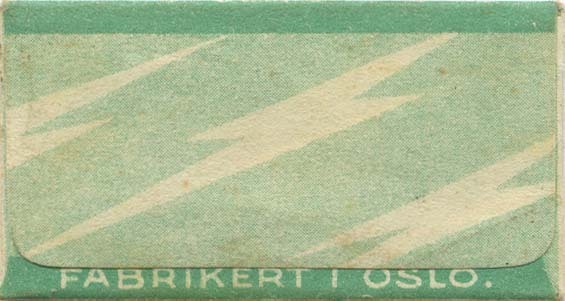 Another simple wrapper, with less text than many. 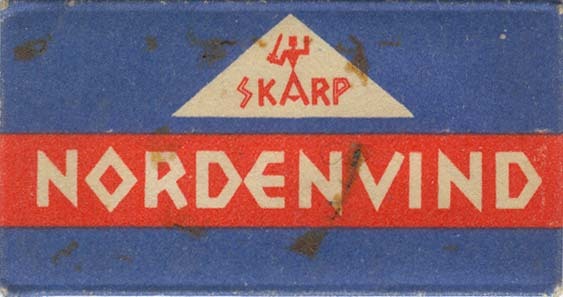 Skarphedin is an old norse name from the sagas - skarp means sharp, and I've not found exactly what Hedin means, even if the name is not died out yet. One source claims it comes from Heðinn, meaning 'fur jacket', and that sounds reasonable. An evolution of the previous wrapper? 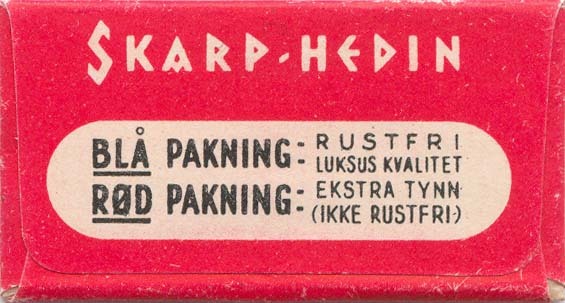 The logo have been replaced by a viking style head, and the encouragement to unwrap carefully is back on the wrapper. Thanks, that's cool stuff. Have you found any of these blades ? Thanks for sharing and translation Hans!